Can You Paint Over High-Gloss With Semigloss Enamel Without Preparation? You can dramatically change the appearance of a room by applying a fresh coat of paint. In addition to choosing between a vast array of colors, you must also consider the type of paint you wish to use and the finish you wish to achieve. There's one more crucial matter: determining the type of existing paint and how to best cover it with new paint. If you're going to apply semigloss enamel paint to a wall that's covered with high-gloss paint, for instance, you'll typically need to prepare the existing surface beforehand. High-gloss enamel paints traditionally cover trim. There are two primary types of paints; water-based and oil-based. Water-based paints, commonly referred to as latex paints, come in a variety of finishes including high-gloss and semigloss. Oil-based paints, also referred to as alkyd paints, also come in high-gloss and semigloss finishes. In the old days, the term enamel applied only to oil-based gloss finishes. Contemporary usage includes both oil-based and water-based high-gloss and semigloss finishes. Interior walls have traditionally been painted with flat finishes while trim work was painted with gloss finishes. Gloss finishes, or enamels, usually stand up better to repeated cleaning, which is important since light switches and door frames are more likely to be handled than wall surfaces. Contemporary decorating norms allow the consumer's taste to dictate whether to use gloss finishes on walls as well as trim work. High-gloss finishes are typically both shiny and slick. This makes their surface extremely hard for additional coats of paint to stick to. While it is possible to paint over a high-gloss surface with semigloss enamel, you will need to first prepare the surface in order to gain satisfactory results. You need to be aware of how old the high-gloss paint that you wish to cover is. 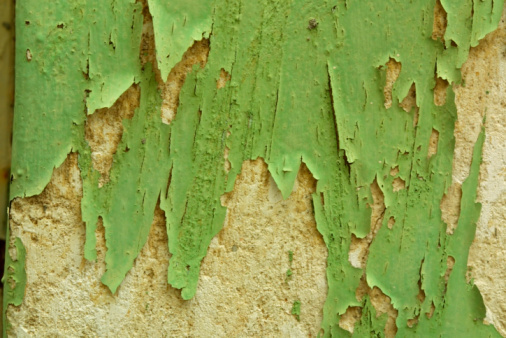 Paints that were manufactured prior to 1978 may contain lead. Preparing surfaces that are coated with paints containing lead may be hazardous to your health. If you know the paint was manufactured after 1978, you can prepare the glossy surface by cleaning it thoroughly and sanding the surface with a light- to medium-grit sandpaper to remove the sheen. Painting the surface with a high-adhesion primer may also help the semigloss enamel stick to the surface. Can You Texture Over a Painted Wall?